Any sales or marketing professional would tell you that turning a visitor into a closed deal is not an easy task. When sales and marketing act in concert to provide prospects the right information at the right time, progression through the sales funnel stops being a difficult action and transforms into a smooth revenue generation engine. The first step in creating this engine is determining qualifying criteria for each stage of the sales funnel; what actions does a prospect need to take to become a MQL, SQL, or qualified opportunity? Once these criteria are determined, marketing can begin taking action to move prospects through those stages of the sales funnel. In aligned sales and marketing groups, both functions deeply understand the specific pain points which your buyer personas experience and your product or service solves. Marketing content is most effective when it accurately addresses these pain points and is targeted to individual buyer personas. Then marketing can purposefully distribute this content through the channels where your audience is most likely to see it. For example, setting up paid social campaigns to a filtered group matching the demographics of the buyer persona, or by creating a smart call-to-action which presents specific offers targeted to an individual viewer. A targeted content strategy provides a personalized experience for prospect and presents more natural pathways for them to progress through the sales funnel. Read more about making sure you're following digital marketing best practices before launching your next campaign. When a prospect converts on a landing page, he or she can be gently led through the sales funnel by building nurture workflows that provides content relevant to later stages in the funnel. For the prospect, this creates a seamless transition as they move through their buyer’s journey. Internally, this helps the sales team determine which prospects are most qualified and ready to purchase. If a prospect is interacting with multiple pieces of gated content, each landing page is an opportunity to gain more valuable information about that person through progressive profiling. Adding queued fields to all your forms means your sales team will be able to see a more robust profile of the prospect’s pains or motivations, which they can be prepared to address in detail during sales conversations. Additionally, this information can help guide future marketing decisions, like informing types of content needed, and ultimately, perpetuating the revenue generation cycle. Through these activities, it’s important to measure their results in order to build repeatable processes. In addition to standard content reporting metrics like views, clicks, and conversion rate (among more), make sure your sales and marketing team is tracking the amount of prospects continuing through or dropping off at each stage of the funnel. 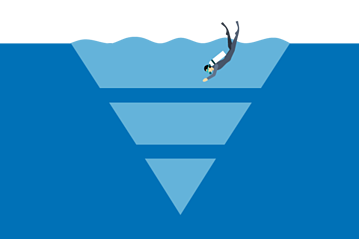 Understanding how your personas naturally move through the sales funnel can help inform sales discussions and marketing programs. For example, if 80% of prospects convert from a visitor into an MQL, you can infer that your top-of-the-funnel efforts are very effective. However, if only 5% of those MQLs are converting into SQLs, it may indicate gaps, misalignment, or other inefficiencies in middle and bottom of the funnel efforts and could severely hinder the ability for sales to close deals. While marketing and sales can sometimes stay removed from one another, both functions are most impactful when they work hand-in-hand. This type of collaborative program creates a better experience for the prospect as they explore the buyer’s journey, while internally providing valuable insights which can be used to perpetuate a successful sales and marketing program. For more information on how to take your sales and marketing program from 0 to 60, check out this free ebook.